The Bowflex Ultimate home gym comes with 90 strength building exercises and a built in calorie-burning cardio rowing feature gives you a complete full body workout. 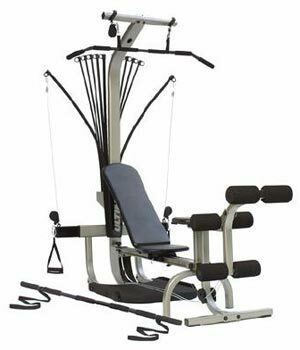 It offers up to 310lbs of power rod resistance, and comes with a lat tower, preacher curl attachment, squat station, leg press, leg extension attachment, and much more. With the Bowflex Ultimate home gym, you can perform most of the exercises available from your local gyms all in a compact space within your home. The simplicity and ease of use of the Bowflex is unparalleled comparing with any other home gym on the market. The vast variety of workout exercises plus a built in cardio rowing station provides the user with a wide choice of workouts. Bowflex Ultimate Power Rod is what provides your workouts with resistance just like free weights do. By providing up to 310lb of resistance, the Bowflex homegym will accommodate a wide range of users with varying strength levels.The standard 310lbs resistance is upgradeable to 410 lbs. Leg Extension / Leg Curl Attachment - allows you to perform leg exercises to develop strong, muscular legs. Perfect for Leg Press and Seated Hamstring Curl exercises. The Bowflex Ultimate home gym offers over 90 exercises that you can perform to build a strong, toned body. With the Bowflex, you can exercise every muscle group in your body with a wide variety of exercises. For the chest, you can do bench press, chest flies, lying cable corssovers; for shoulders, you can perform seated shoulder press, lateral shoulder raises, shrugs, reverse flies, military press; for back muscles, you can perform pulldowns, seated rows, bent rows, lower back extensions; for arms, you can do bicep curls, tricep pushdowns, french press, preacher curls, tricep kickbacks, wrist curls; for legs, you can do leg extension, leg curls, squats, leg press; for abdominals, you can perform ab crunches, reverse crunches, seated ab crunches. And don't forget, the bowflex ultimate also comes with a built in rowing station for your cardio workouts. The Bowflex Power Rod units are so strong, you can flex them repeatedly and they won't wear out. In fact, they're so strong they have a no-time-limit warranty. If you wear them out, Bowflex will REPLACE THEM for FREE. The Bowflex Ultimate home gym is a superior product, and Bowflex provides a guarantee that stands behind it. Your satisfaction is guaranteed. Just purchase your machine and workout for up to six weeks. If you're not 100% satisfied with the results, simply contact the Bowflex customer service department for Return Authorization. Bowflex machines are warranted to the original purchaser. Bowflex home gyms limited warranties cover all defects in material or workmanship but do not cover commercial use or misuse by the consumer.